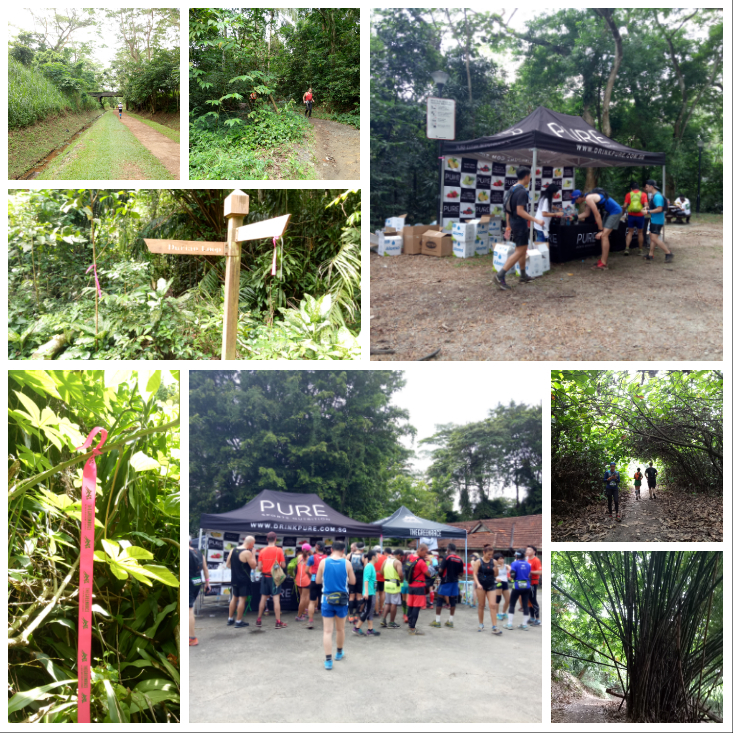 Race Review: The Green Race Forest 60 [42KM] (by maylindateo) | JustRunLah! I wanted to challenge myself to try running 42KM on the trails. Have done so many 21K road races and 1 trail race, I know I can do 21K but not sure about 42K. So I signed up for 42K trail marathon with the Green Race. Have been battling with plantar fasciitis for months and shin splints for the past few weeks, hence I did not train enough for this race. I was just hoping to be able to complete the race within their cut off time of 8 hour 15 minutes. I did not want to downgrade to 21K upon my friend’s advice because how could I give up without even trying? I wanted to try it badly, so downgrade was not an option for me. The 42K route was actually 21K route x 2. The trail was very challenging with many uphills and downhills, rocks and stones which cover Durian Loop, Zhenghua Park, Zhenghua PCN, Chestnut Hiking Trails, Gangsa Trail, Central Catchment PCN, Mandai Track 15. When I reached the CP at the U-turn point, there was no more water, only Coke. I don’t normally drink coke because I dislike gassy drinks. I had no choice but drank some coke because I wanted to reserve my water in my water bag. The CPs were placed far apart. The final stretch to the finish line was so long and the course was actually 22+KM. I did some stretching exercises and sprayed muscle spray on my legs and back for backache. Rested for about 15 minutes before going for the second loop. I was feeling fine when I ventured into my second round but soon, I was hit by fatigue and loss of energy. I walked for long stretches like a snail. I did not know why I did not take my energy gel when I experienced numbness in my arm, shoulder and neck. Both my hands were swollen. After sometime, I finally took my energy gel and it worked like magic, I was feeling energetic again and was able to run again though I was still slow. I only saw a few 42K runners heading back already when I still had a long way to go to reach the U-turn point. Many 60K runners encouraged me along the way because they were the only people left in the trail, all 21K and 42K runners had finished. Even the hiking aunties encouraged me. I was wondering how long more to reach the U-turn, and a beautiful 60K runner lady told me the U-turn was just in front, I was almost there. I ate some food at the CP, sat down to rest for 10 minutes before heading back. The route back was horrendous. My legs ached like hell, couldn’t run, even walking was a challenge. I wanted to just go home but I was in the middle of the forest, the only way out was to keep going. I took another gel and felt better again and tried running a little. Soon, fatigue set in again, back to walking in a crawling pace. I felt relieved when I reached the resting area for hikers and a volunteer was standing there. She clapped for me but I told her I needed to sit down. Then I told her I couldn’t meet the cut off time. She said “it’s okay it’s okay, just carry on, it doesn’t matter, when you finished, you will have the feeling of satisfaction”. I almost cried. After resting for a few minutes, I thanked her and told her I’d better go now and bade her goodbye. I realised my water bladder had no more water and after some distance, I reached a public toilet and went to drink water from the tap. No more volunteers at major junctions and I had to figure out the way by following the ribbons. At some junctions, there were no ribbons at all and I wondered if I was on the correct path. At one particular split path, I couldn’t find any ribbons and I thought I was on the wrong track and got lost. 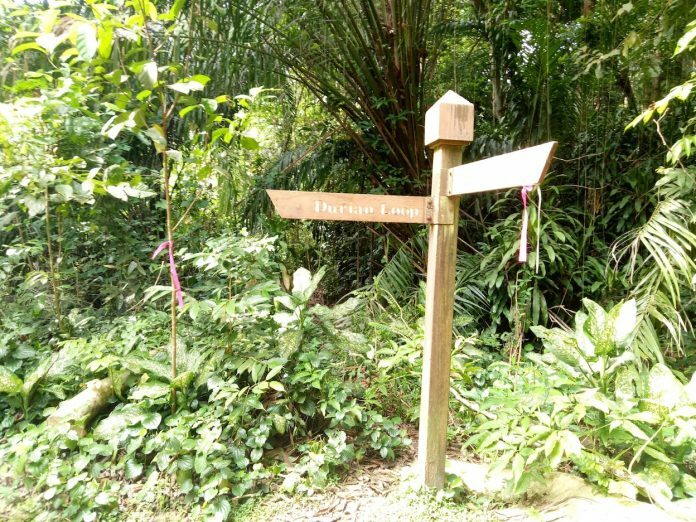 I wanted to turn back and luckily saw three 60K runners heading towards me and I asked the lady which way to go, she was not sure too until I finally saw a pink ribbon further away on the left path. It was hard to see. The lady was fast and soon she was gone. I followed the other 2 runners as I didn’t want to be left behind. I was suffering with extreme exhaustion, pain on the legs and no water, I wasn’t sure anymore if I could make it to the finish line. I very much wanted to because nobody want to DNF a race. 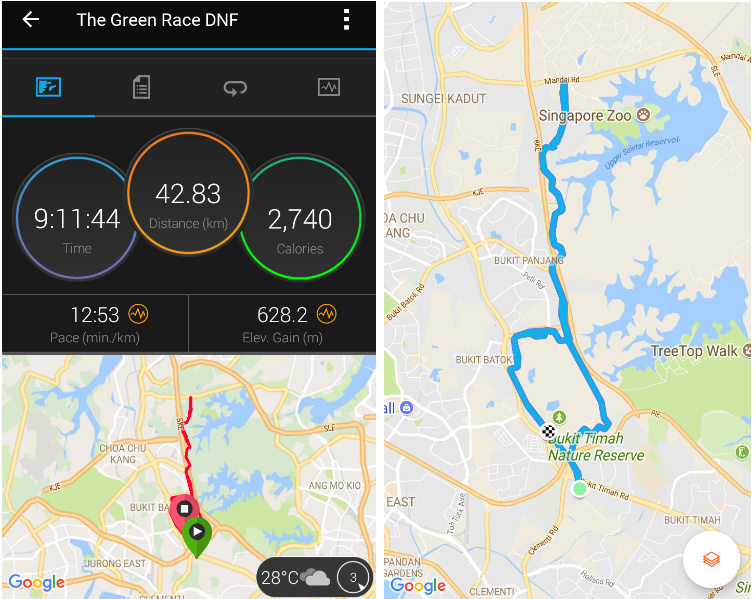 I looked at my distance on the low battery watch, I almost reached 42K and when I finally reached, there was no sign of the finish line yet and I knew the way back to the finish line would take another 2KM+. It was a painful stretch… very very painful. The time was running late and I was eager to go home to attend to my family. I had been in the trail for 9+ hours. This 2KM would take me forever given my physical condition at that moment. With a heavy heart, I went down the slope near Hindhede Dr and hailed a taxi back. I felt disappointed I did not finish the race but I had actually achieved my target of a 42KM distance in the trail. So I have no regret. Success is a journey, not a destination. The doing is often more important than the outcome. It was an experience worth achieving for. No worries and don’t give up. Take it with a pinch of salt and try again. I am sure there are other trail with a more generous cut off time. Good luck for your next run! Thank you Half Marathon Man. Good job Maylinda!! Super tough but you finished in the end! By signing up for 42 Km, you are already a winner. Most important is take care of your health. Can always try again next year. It’s OK to DNF when the body can’t take it anymore. I was one of the volunteer in CP1 and I have encountered many others who decided to DNF. And some of then are season ultra runners! 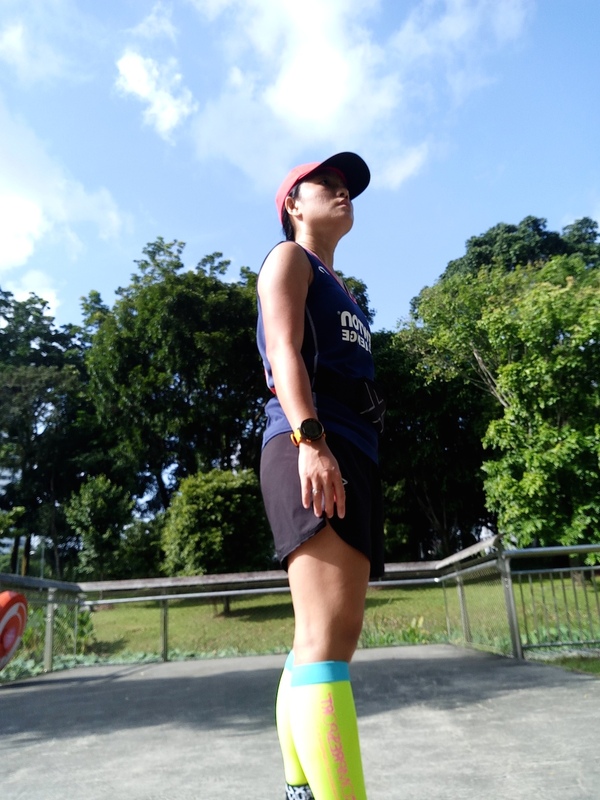 I think it’s especially hard to run in the afternoon, when most of our training runs are in the morning, so to prepare for races over 4 hours, you need to train to take the afternoon heat. I think that is key, especially in our tropical trail, it’s so so hard to physical body. Hey HS Ong, thanks! I need a longer rest and will come back stronger!